The digital camera market is shrinking in more ways than one. Compact system cameras now offer the advantages of DSLRs, minus the weight and bulk, and smartphone cameras are gradually making traditional compacts obsolete. Enter wearable cameras – add one to your outfit and you're ready to capture the magic of the everyday, without having to walk around with a smartphone attached to the your face or that anxious feeling in your stomach that you're going to miss something. The art of lifelogging hasn't really taken off yet and we've already had our first major casualty after Autographer decided to put its camera on hold for the time being. But if you still like the idea of keeping a record of your entire day, we've picked out the cameras you clip on now and in the near future. The Narrative Clip 2 upgrades over its popular predecessor by adding a raft of new features. It now boasts wireless connectivity, Bluetooth, an improved interface, light sensitivity and image quality, now at 8MP, with a 90-degree lens. The sleek, minimalistic design weighs in at only 20g, measures just 36x36x9mm and comes with a modular backside for more wearing options. A charge will last 30 hours, it has an 8GB memory and takes a photograph every thirty seconds and allows you to double click to manually tell it to shoot. The new Narrative app makes browsing, organising and sharing a cinch. EE's dinky little clip-on camera offers live streaming over 4G and can be worn on a shirt for shooting up front or on your bag to record action from the back. Inside the pint-sized body lies an 8-megapixel camera sensor to shoot stills and video footage at up 1080p HD at 30 frames per second. For livestreaming, that drops down to 720p HD at 30 frames per second and it's all done through EE's own Skeegle companion app. There's also dedicated EE Capture Cam app (iOS and Android) where you can control the camera remotely and keep an eye on your data to make sure it's not taking a huge hit. Claiming to be the smallest lifelogging camera out there, YoCam's all-in-one shooter can be worn around your neck, on your clothes and even mounted to your bike. It's also IP68 waterproof up to 20 feet so you can shoot underwater without any additional housing. It packs Bluetooth and Wi-Fi to cover the key connectivity bases and records at a maximum of 2.7k at 30 frames per second. It also manages to find room to include image and video stabilisation to keep footage steady and a raft of camera modes like the ability to delay shots and burst shooting. Expect to get two hours of filming your day before it needs to be plugged into its charger. Still very much a "conceptual vision" according to Sony, the Xperia Eye is a lifelogging camera that unlike others on this list, can also detect voices and recognises faces to decide when to take photos and make sure you don't miss those capture worthy opportunities. Packing a 360 degree, spherical wide-angle lens and Sony's intelligent shutter technology, it looks a lot like the now ditched Autographer and is able to be activated through voice commands for hands-free control. We don't have any more specs yet, and when or if it lands, it's likely to look a whole lot different to the way it currently does. SnapCam is small at 1.5 inches square and weighs a little more than an ounce, but it's a powerful extension of your smartphone, saving photos and video to micro SD or directly to your device via Bluetooth or Wi-Fi. Tap once to take a photo – take up to 5,000 8MP images in time-lapse mode, on a single charge. Double tap for HD 720p video – you get 2.5 hours or an hour of live broadcasting per charge. Attach it to your clothes with the magnetic clip and you're ready. 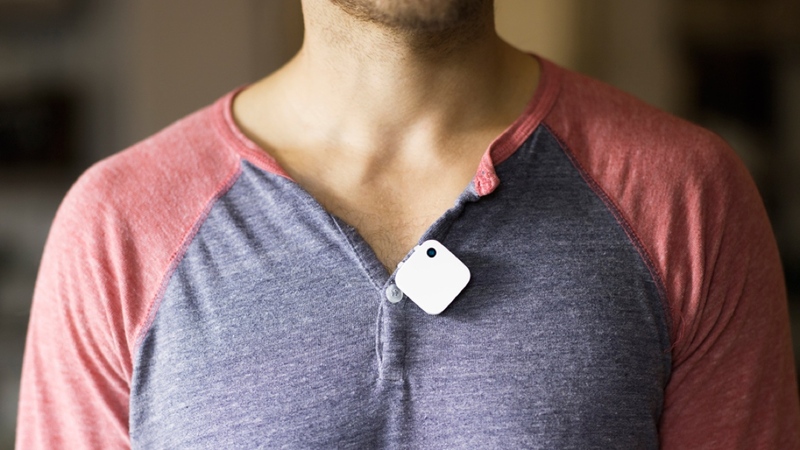 MeCam HD measures 2×2 inches, weighs 2.5oz and can be worn via clip bracket, safety pin bracket, or neck strap. It captures both photos and 1080p HD video. Night photography is catered for thanks to a built-in low light sensor and it has three time lapse photographs modes: 2sec, 30sec and 1min. Impressively, there are also a further three burst modes: 5, 10, and 30 photographs. It has built-in Wi-Fi for remote viewing and instant sharing through the MeCam App.